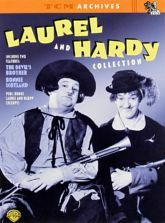 Having begun their career in the silent film era, Laurel and Hardy made a seamless transition to the talkies, and these two feature films show how effectively the comic duo made its mark in the new medium. In The Devil's Brother (1933) they play Stanlio and Ollio, two 18th-century rubes at the mercy of bandit Fra Diavolo (Dennis King); this film introduced the classic physical comedy routine "Kneesy-Earsy-Nosey." From 1935, Bonnie Scotland finds Laurel and Hardy escaping jail, finding misadventures in Scotland and India. BONUS: Extras include a potpourri of excerpts from some of their films; commentary by Leonard Maltin and Richard W. Bann; and the TCM documentary Added Attractions: The Hollywood Shorts Story, a survey of short films and newsreels from the golden age of film.